Mono shock absorb suspension hagon triumph triple street 675 2007> 2013. Shock absorb with micrometric spring preload adjustment. The assembly does not require any modification, the package includes the necessary mounting and the "c" key for preload adjustment. Greater adherence to dry and wet. Comfort at the highest levels. The shock absorbers have been developed in england to improve the comfort and safety of your bike. Designed to have a dramatic improvement in dynamic quality and reliability over time. Suspensions are a fundamental part of the motorcycle, excellent suspensions are good driving skills. Perfectly interchangeable with the original, the hagon suspension is a good alternative to the standard ones, thanks to the competitive price. 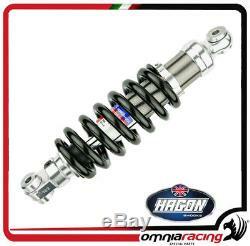 A wide range of shock absorbers that cover all of the world's production, especially vintage motorcycles, to replace the original damaged ones, with the great hagon products. Warning: the product shown in the picture is generic. Some features (example: upper, lower, and middle distance) may vary for your specific application. The kit includes everything you need for assembly. It is possible to order the optional hydraulic system by clicking on the image below (code 3000h). Caution: for space issues, it is not possible to mount the preload on all shock absorbers, so be sure to check before purchasing. In 1994, the passion and experience of manufacturing bertollini created omnia racing, with the aim of representing a reference point for everyone fond of bikes. In 2000, when salvatore orefice joins omnia racing, the company is founded, a society based on the passion and competence needed to create and trade the top products for motorbikes. Our continuous search for perfection and performance, using advanced technologies, has allowed us to interact with internationally recognized pilots and teams. Our products are excellent for both road and circuit use. They are continually tested by our technicians and pilots, thus improving the dynamics, dynamics and structural features of the materials adopted. The experience gained through the years of the competition has been greatly improved. Accostato, afam, aim, akrapovic, andreani, arrow, bazzaz, bc battery controller, bitubo, bmc, braking, brembo, bst, capit, castrol, derry moto, tuning fork, did, discacciati, eibach, ek, fabbri, far, frentubo , galfer, gbracing, giannelli, gifrap, givi, gopro hero, gpt, h2o, hagon, ixil, jollymoto, kappa, laser, lcr saddle, leovince, lightech, mafra, marchesini, marvic, marzocchi, matris, mivv, mra, nissin , ohlins, pbr, polini, pt, rizoma, rme, robby moto, sachs, stm, stomp, superb, suter, termignoni, valtermoto. Omnia racing is one of several important events: padova expo bike, national and international races, free circuit sessions. On the web, we are always associated with a direct contact with the customers, so we suggest the product that best suits their needs. This should allow our customers to feel at ease. All this has not been a decade ago, a reference point in italy; in addition, our products are still in demand in Europe and in the United States. The item "mono shock absorber suspension hagon triumph street triple 675 2007 2013" is for sale since Thursday, April 26, 2018. It is in the category "auto, motorcycle parts, accessories \ motorcycle \ spare parts \ suspension, steering \ shock absorbers". The seller is "omnia-racing" and is located at 80055. This item can be delivered anywhere in the world.